One of the more gratifying things one can do is to be able to put knowledge to good use, and I was able to do exactly this last weekend as I was able to lead a historic neighborhood tour of Akron’s Goodyear Heights through @Akron2Akron, a local group that helps organized and promote city neighborhood tours in an effort to help residents discover and appreciate the places where they live. This pedestrian pathway and steps was dedicated to Clara Bingham, a 47-year Goodyear employee who was popularly knows as "The First Lady of Goodyear." I won’t go into a lot of detail in this post—there is a downloadable brochure I prepared; a PDF Dropbox link is HERE if you’d like to read more about it. In short, Goodyear Heights is one of the better American examples of the Garden City Movement as it was transformed into a high quality community for industrial employees of Frank Seiberling’s Goodyear Tire and Rubber Company. Planning began in 1912, when Seiberling used his master landscape designer, Warren Manning (who had already designed the grounds at his landmark Tudor-Revival mansion, Stan Hywet) to layout a small town for his workers. Manning, who was a senior assistant to the legendary landscape designer Fredrick Law Olmstead, laid out a masterful plan that followed the topography of the site, leaving many open areas for parks and other public areas. Seiberling also hired noted architects to design attractive homes for the community; rather than settle for typical utilitarian worker housing, he insisted on a wide variety of higher-quality “cottages” – many of which were based on traditional English small home designs. 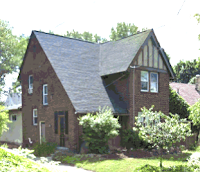 While the community is also home to a number of other popular early 20th century house styles, like bungalows, craftsman-style homes and quaint colonials, the English influence is clear, from the Tudor-revival Boy Scout Center to more modest homes reminiscent of small houses by Voysey, Baillie Scott and Lutyens. Other buildings in the area followed this trend, including the original high school (built to resemble a Tudor palace) the neighborhood’s public library and Goodyear Hall, which was the company’s educational center and recreation building. Due to the neighborhood’s size and historic character, our @Akron2Akron tours were held over two days, with two distinct tour routes offered on each date. The tour I led followed a slightly more challenging uphill route, following a series of pedestrian paths and steps that had been integrated into the neighborhood’s original design, allowing convenient access between various street levels. Pour other tour followed a more level route, through the project’s initial phase and taking in some of the open park spaces that Manning had preserved. On each route, the guides were able to discuss the history of the development, the challenges of construction and the wide variety of home designs found in the there. The weather was perfect, with everything so green and the flowers in bloom, the neighborhood showed quite well, and afterward, everyone was able to meet at the gazebo at the “square” on Pioneer Street for refreshments and cookies. This public area offers a great opportunity to capture Manning’s (and Seiberling’s) original vision, with its human scale and comfortable mix of buildings used for commerce, housing, social services and worship. In recent years, the R.I.G.H.T. Committee (Resident Improving Goodyear Heights Together) led by Sharon Connor, has done an outstanding job in helping to build the gazebo, restore and maintain the rose garden here, and helping to stabilize and improve the neighborhood. Overall, the tours were a great success; somewhere between 75-100 people attended the first Thursday evening tour on June 9th, and another 35 or so attended the Saturday 6/11 follow-up--making this the best attended @Akron2Akron event so far. It was nice to see that not only did we have attendees from all over Akron, but that a number of neighborhood residents came out as well to discover more about their neighborhood and celebrate its history! The gazebo was built almost 20 years ago by community volunteers, using materials, proportions and a scale that would compliment the surrounding buildings on the public square. The @Akron2Akron tour is the first of many activities planned for Goodyear Heights, as current and former residents, city officials, preservationists and other activists are finally coming together to develop plans to protect and preserve this historic neighborhood, which has been recognized for its significance on both the state and national level. During our tour, I discovered that part of the Heights had actually been nominated for the National Register of Historic places back in the 1970’s, but a short-sighted city planning director had discouraged the nomination. Currently discussion has centered on developing a simpler local historic designation as a start, in combination with educational programs and some local funding to encourage and support the preservation and restoration of neighborhood homes. This was just some of our Thursday night tour group - one more busload of trolley riders was yet to arrive! A city trolley bus was available to transport attendees from parking areas nearby to the starting point on Malasia Road.